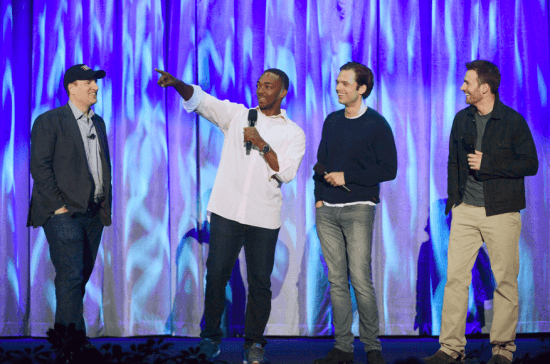 The biggest presentation of the 2013 D23 Expo was held by the Walt Disney Studios on Saturday, August 10 to a packed D23 Arena crowd, filled to capacity in anticipation of celebrity guests and plenty of surprises. After running through a history of recent Disney acquisitions – Pixar, Marvel, and Lucasfilm – making a point to officially welcome Lucasfilm to the Disney family. “Our priority is, of course, Star Wars,” he said. 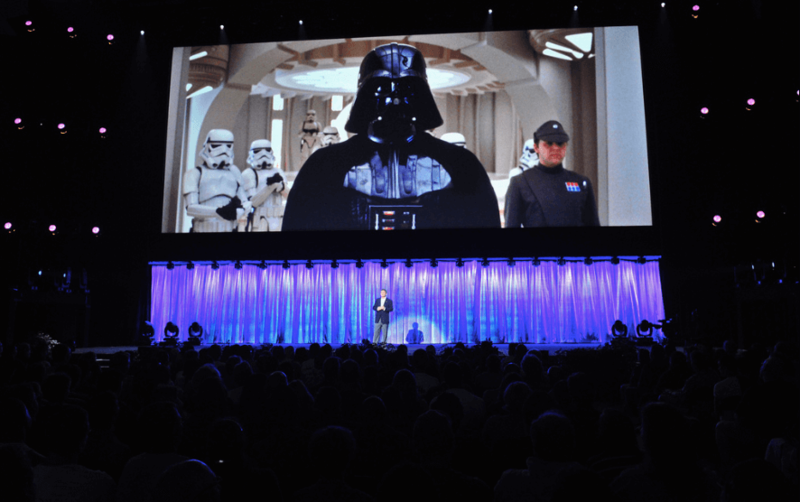 “I remember being blown away by the first film in 1977.” He went on to praise director JJ Abrams and composer John Williams, emphasizing that Episode VII is still a couple years away. After stating “I really wish I could tell you more,” Horn was interrupted by the Darth Vader march, only to continue “But there are dark forces and they are watching.” And that ended the Star Wars talk for today. Natalie Portman and Anthony Hopkins joined Hiddleston and Feige on stage, saying a few words about making the movie before showing a clip of Portman’s character ending up on Asgard for the first time, with some intriguing health issues. After that trio left, Feige moved on to “Captain America: The Winter Soldier,” showing action-packed footage featuring an epic elevator battle mixed with a bit of humor. Then Feige welcomed to the stage Chris Evans, Anthony Mackey, and Sebastian Stan. 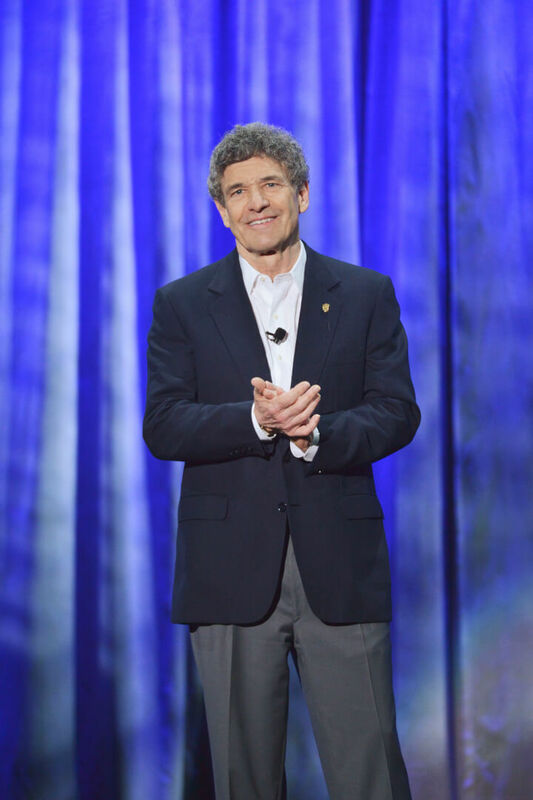 Mackey, always the comedian, said to the crowd, “All of you up there. You are now looking at the Falcoln. 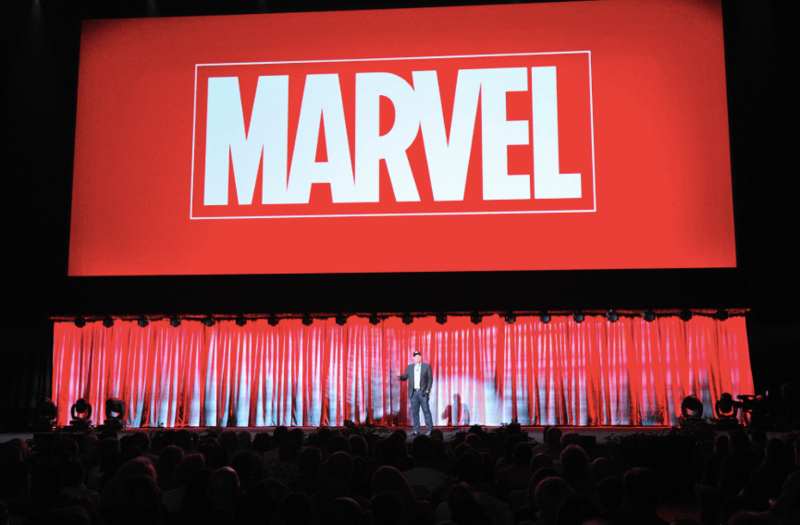 Don’t let the pink shirt fool you.” Then Feige offered a rough, still-in-progress sequence from the upcoming film, which showed just how much work goes into every shot in a Marvel movie. Feige then showed the same sneak preview of “Guardians of the Galaxy” that was offered to the Comic-Con audience, likely the last time it will be shown as the film is very early in production. The movie is quite light-hearted, but with interesting and unique characters that definitely have a chance at capturing the world’s attention. No “Guardians” cast members were in attendance though. Finally, Feige left the stage, leaving the audience with a teaser clip for “The Avengers: Age of Ultron” – which didn’t really show much of anything other than a swirling Iron Man mask mixed with hints of other character appearances. Next, Alan Horn retook the stage introducing Disneynature’s “Bears,’ debuting the trailer for the upcoming film, also announcing that Disney has partnered with the National Park Foundation, offering donations for all tickets sold within the first week of the film’s release. 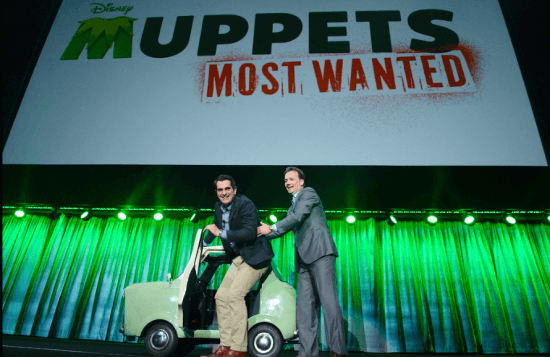 The presentation was then handed over to Sean Bailey, president of Walt Disney Studios production, beginning with a preview of “Muppets Most Wanted,” featuring a Kermit the Frog doppelganger amidst a worldwide caper. The film looks sufficiently insane, as any Muppets movie should be, featuring plenty of celebrity cameos among even more Muppets. After praising the cast, Bailey welcomed actor Ty Burrell to the stage, rolling out in a tiny Interpol car seen in the film. After Burrell climbed back into the car and drove away, Miss Piggy showed up on screen, introducing Tina Fey and Kermit wearing “P23” shirts to honor the fans of – Miss Piggy, or so she thought. 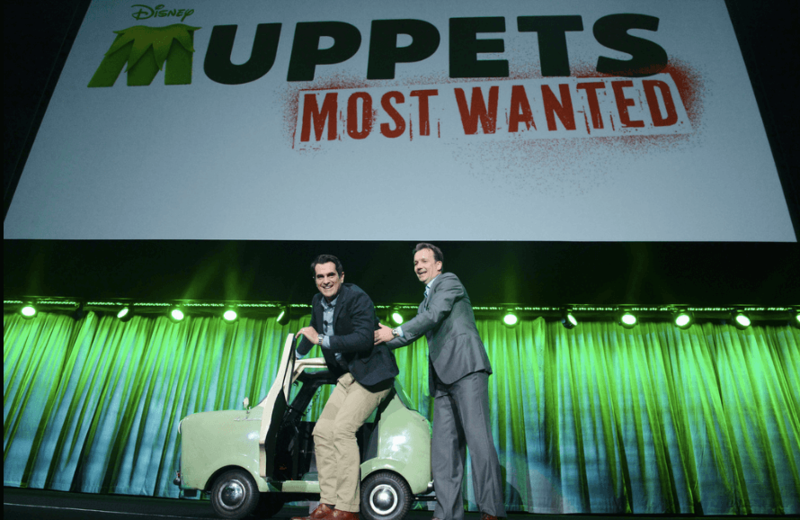 Lastly, a first clip from “Muppets Most Wanted” was shown featuring the evil version of Kermit fooling the Muppet gang into believing bad guy Constantine Badguy played by Ricky Gervais in a bizarre musical number. Then the “Into the Woods” musical cast was officially announced: Meryl Streep as the witch, Johnny Depp as the big bad wolf, along with Anna Kendrick, Chris Pine, and Emily Blunt. 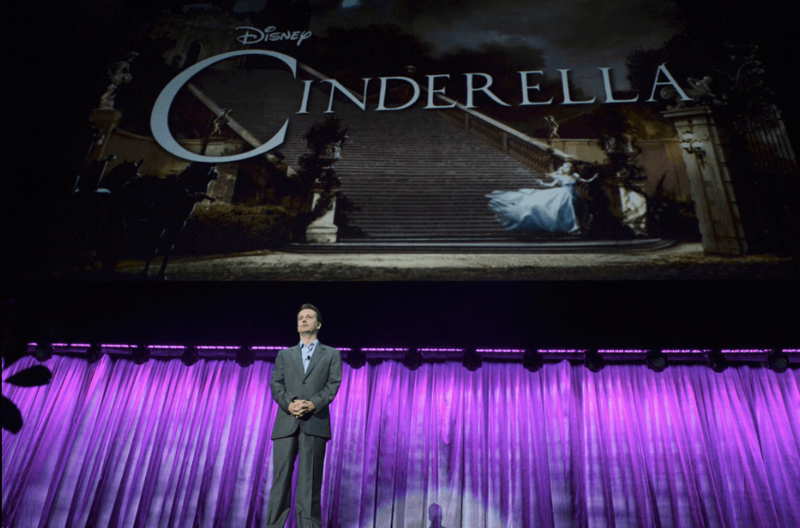 Next Bailey introduced the upcoming live action “Cinderella” film, bringing director Kenneth Branaugh on screen to show a first look at concept art and early screen tests. It sets the stage as a faithful retelling of the classic Disney animated film in the real world. 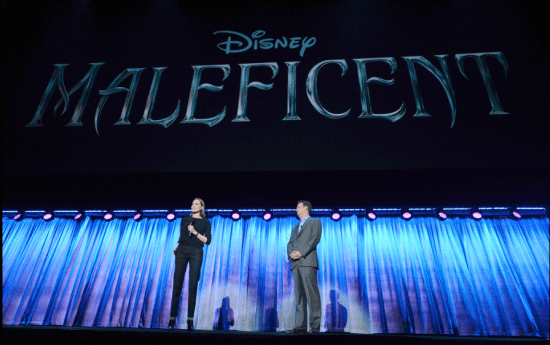 Big applause greeted the next film: Maleficent. To choose the title star, Bailey said “this list had only one star” – Angelina Jolie. The new film will tell the full “Sleeping Beauty” story through Maleficent’s eyes, adding new scenes. It begins with Maleficent as a teenage fairy and getting betrayed, leading up to the familiar events from the classic film. Flora, Fauna, and Merriweather will be in the film, along with the climactic dragon battle. Then the audience was surprised to see Angelina Jolie appear on stage, telling of her excitement for the role. “”Maleficent was always my favorite. I was terrified of her, but I was so drawn to her. […] She was wonderfully, deliciously cruel,” she said. 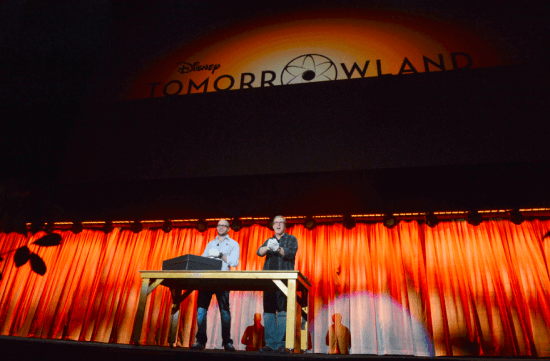 The mysterious “Tomorrowland” film from Brad Bird and Damon Lindelof was next, arriving on stage following an introduction video detailing Walt Disney’s optimistic fascination with the future. 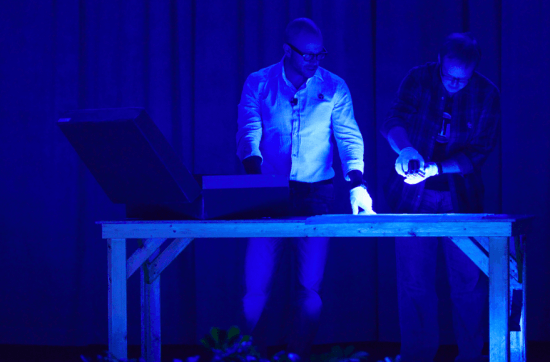 They pulled out the dusty “1952” box used to tease the film for the past few months, showing a hoaxed(?) photo of Walt Disney and Amelia Earhart, an issue of “Amazing Stories” that matches up to reveal a secret message with another paper, It’s a Small World blueprints that reveal hidden plans under blacklight, and a mysterious disk labeled “A History of Tomorrowland” featuring a degraded animation that hinted at great minds of the past – Edison, Telsa, and others – coming together to form a secret society. The viral promotion continues as the movie doesn’t release until December 2014. 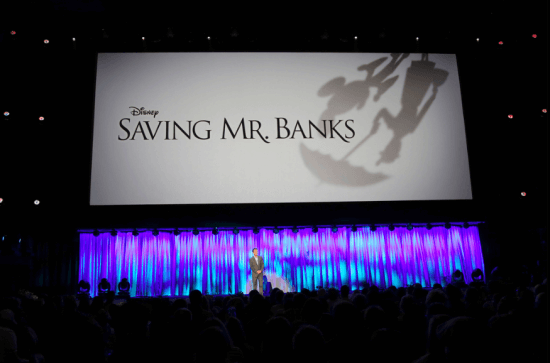 Then the Disney fan audience cheered wildly for the introduction of “Saving Mr. Banks,” the story of Walt Disney wooing “Mary Poppins” author PL Travers. 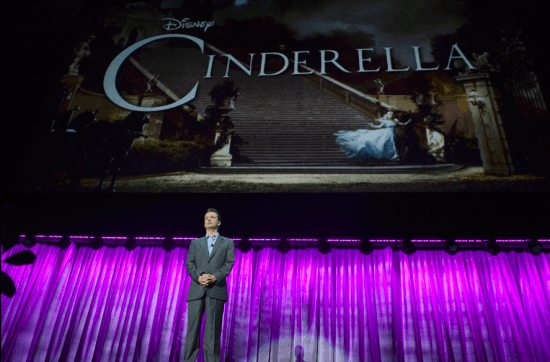 Two clips were shared from the film, one a funny and powerful meeting of Walt and Travers in his office and the other a comedic encounter at Disneyland as Walt continues to convince Travers to sign over the rights to her story. 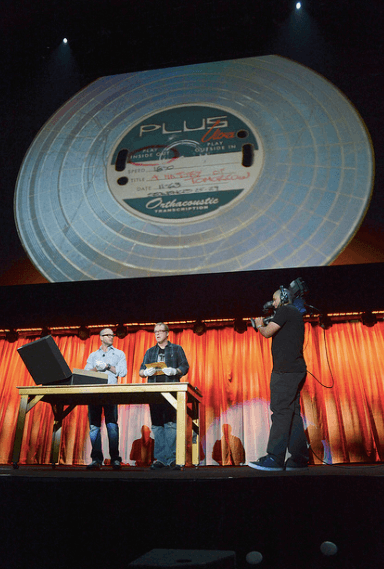 After a clip of the duo dealing with Travers’ persnickety attitude toward their songs, Novak and Schwartzman returned to the stage with a piano, singing “Let’s Go Fly a Kite” – then joined by Richard Sherman himself. Kite flyers appeared throughout the stage and audience to a rousing rendition of the song, much to the delight of the audience. And that was the conclusion of the presentation. I’m so exchited for “Into the Woods”.Johnny as the big bad wolf and Meryl as the witch!! !I must see that!!! Bah, no John Carter 2?! Ummm…John Carter was a box office bomb and cost like $200 million to make… I highly doubt that they’re going down that road again. It didnt even sell well on DVD or Blu-Ray. It’s in the $5 bin at Wal-Mart. 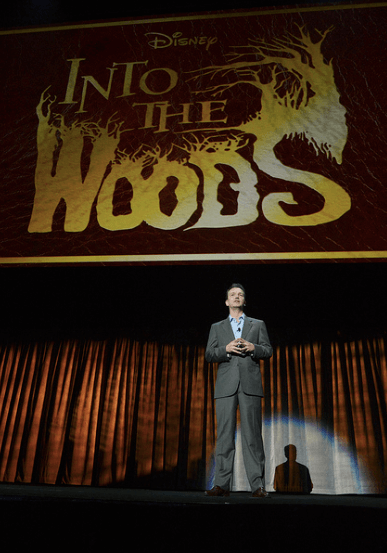 Into the Woods sounds great. No so sure about Mr. Banks but it could be a surprise because the casting is so good. I am a big reader (for work and pleasure) and there are two recent books that are so Disney friendly that I am surprise they didnt get picked up – Jennifer A. Nielsen’s ‘The False Prince’ (for the boy hero crowd) and Caitlen Rubino Bradways ‘Ordinary Magic’ (for the girl hero crowd). The Nielsen book is about an orphan who is forced to impersonate a kings long lost son, very fast paced with themes of truth and honor. The Rubino Bradway book is about a girl who lives in a world where magic is what is normal and as an ‘Ord’ – someoen without magical powers, she is considered an outcast – sort of Harry Potter in reverse. Both are really good adventure tales. eroberten die schillernde Kasino Welt im Fluge und viele Casino Fans verlie. in store for Furry Farm and this is just the first release of the game. These Disney films like my favorite Aladdin will stick to the minds of children which have seen good films with their family. This is how Disney film stick.